Strawberry Shortcake is a classic dessert. 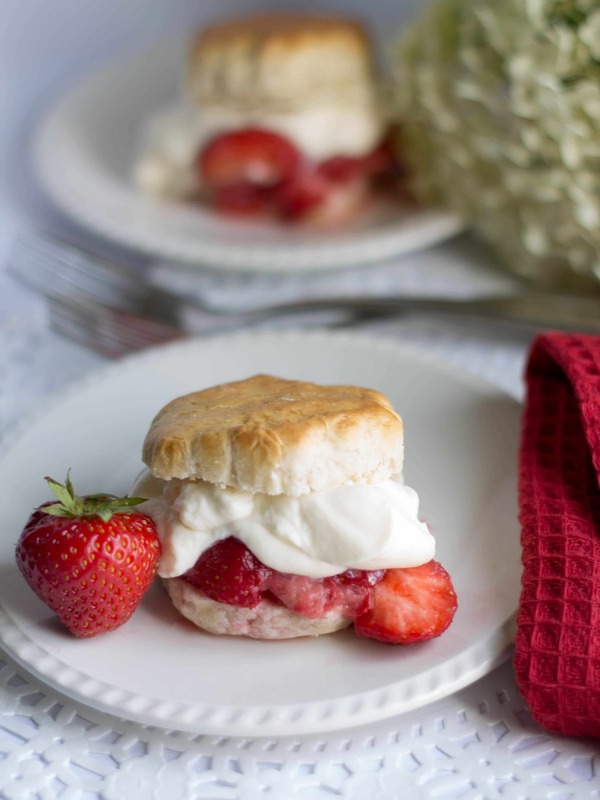 With tender, buttery biscuits, topped with sweet strawberries, and whipped cream - this recipe is bound to be a family favorite! Strawberry Shortcake is a classic dessert. 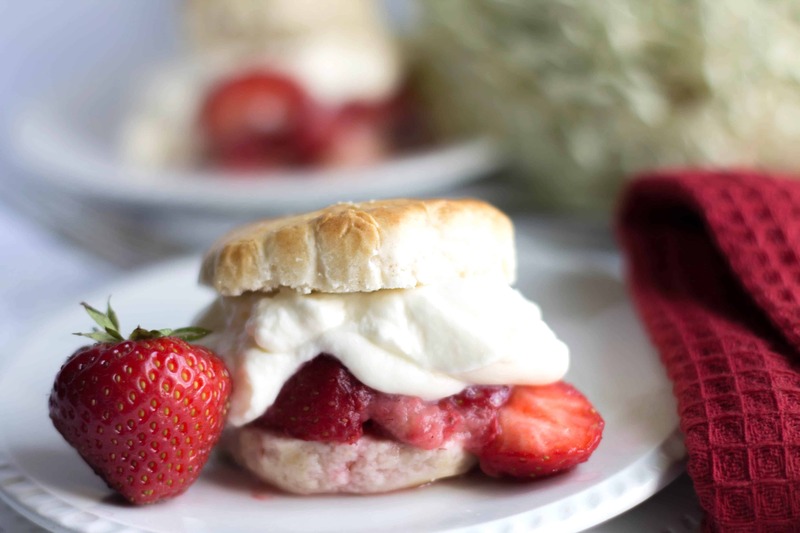 With tender, buttery biscuits, topped with sweet strawberries, and whipped cream – this recipe is bound to be a family favorite! Since starting this blog, I’m making my way down the long list of American desserts that are not available here in England. Strawberry Shortcake is one of those desserts (although England has it’s own version that can’t be duplicated in the US that I’d miss tremendously if I left). 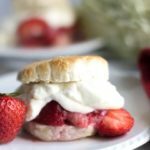 What could be better than sweet scones, whipped cream, and strawberries combined in a mouthwatering treat? The soft, buttery scones soak up the juices, while the whipped cream adds a light, creamy richness. Nothing says summer quite like this simple, yet luxurious strawberry dessert. Even better, by adding the a bit of skimmed milk powder to the whipped cream, it will keep it’s shape so it can be assembled ahead of time and wait patiently in the refrigerator hours before serving, saving you time and effort in the kitchen that you could be spending with your family after dinner. I’m sorry for the lack of assembly preparation photos, but when my laptop crashed, I lost that set of photos. Luckily, I have these few to share with you. In a large bowl, sift together the flour, sugar baking powder, and salt. Cut the butter into the flour mixture until it resembles course bread crumbs. In a separate bowl, whisk together, the cream, milk, vanilla and egg. Stir the wet ingredients until combined then turning out onto a lightly floured work surface to complete bringing it together with your hands. Press the dough out into a rectangle about 10-x-14-inches. Then take the pastry cutter and tap it sharply so that it goes straight through the dough. When you have cut as many as you can, knead the remaining dough together again and repeat. Then place the scones on the baking sheet. Brush the tops of the scones with milk. Bake the scones for about 12-15 minutes until lightly browned. Allow to cool 20 minutes before assembling the shortcakes. Meanwhile, using a mixer or food processor, beat the cream, skimmed milk powder (if using) and sugar until soft peaks form. Set aside. Combine one cup of strawberries, the sugar, vanilla and orange juice in a bowl. Mash together with a potato masher. Stir in the remaining strawberry halves. Cover and chill. Cut scones in half horizontally using a serrated knife; place each bottom half on a dessert plate. Spoon about a 1/4 cup of the strawberry mixture over each bottom half. Top with whipped cream, followed by the shortcake tops. If you have left over, you can repeat the strawberries and cream on top as well.